Does HTC's new handset pose a threat to Apple's flagship? Many smartphones are sold on the basis of their camera functionality. HTC will be hoping that its newly-revealed Desire Eye has the goods to pull in customers that use their phone primarily for pictures and selfies. However Apple's all-conquering iPhone 6 has become the weapon of choice for the selfie crowd and displacing it isn't going to be easy. Toting a front-facing 13MP camera with dual-LED flash means the Desire Eye has the edge over the iPhone 6 when it comes to pure hardware. But Apple has spent years cultivating the iPhone into the ultimate portable camera. How do these to handsets fare up? Apple's version of big for the iPhone was bumping the screen up to 4.7-inches. Well, such tricks have become run-of-the-mill for Android and the Desire Eye has arrived with a 5.2-inch Full HD screen that not only has the iPhone beat on resolution (1,920 x 1,080 compared to 1,334 x 720) but also on pixel density (424 ppi compared to 326 ppi). Is 4.7-inches the right screen size? Despite this, Apple's IPS LED-backlit display still means that clarity and color reproduction are better than the specs would have you believe. However, when it comes to sharpness, HTC's device can match the iPhone despite its larger screen. 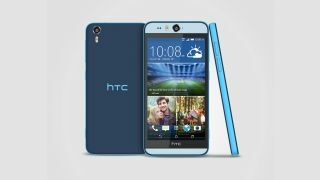 Apple has somewhat countered with the introduction of the iPhone 6 Plus, but the fact remains that if you want Full HD and a larger screen, then take the HTC Desire Eye over the iPhone 6. While HTC has thrown considerable weight into the Desire Eye's specifications and camera functions, the design is where it shows its mid-tier roots. The Eye is built from polycarbonate casing and has added IP67 waterproofing but still can't touch the build quality of Apple's iPhone 6. The object of your desire? Apple's creation is a blend of glass and aluminium that comes in at only 6.9mm thick and weighing 129g. Apple's gone back to the curving design language of the iPhone 3GS and it contrasts sharply with the big, bulky Desire Eye. The TouchID home function is still one of the most intuitive design traits on any smartphone and, while HTC has kept the front of the Eye remarkably neat, it doesn't exude the same quality as an iPhone. HTC clearly isn't out to design the most premium phone they can with the Desire Eye - that's why it's got the HTC One M8. So, without doubt, the winner in terms of design is the iPhone 6 here. We're still waiting to hear on what the pricing will be for the HTC Desire Eye, as well as when the official release date will be. However, we're willing to bet a considerable sum that it won't be as expensive as Apple's iPhone 6. The iPhone 6 starts at $199 (around £123, AU$216) for the 16GB version and goes up to $399 (around £248, AU$433) for the 128GB version on a two-year contract. Both the iPhone 6 and iPhone 6 Plus have been marked out for their expensive price tags and the answer here is simple, if you're tight on funds and trying to decide between these two - go for the HTC Desire Eye. Despite being Apple's very latest flagship, the iPhone 6 is an interesting mix of more and less power. There's the new dual-core 1.4GHz A8 processor on board that, Apple claims, runs 20% faster than the iPhone 5S. And yet, the handset only boasts 1GB of RAM - which isn't much when most Android handsets are packing at least 2GB of RAM. As ever, the integration with iOS 8 has some part to play and on a day-to-day basis, Apple's phone performs remarkably well. The Desire Eye has some slightly beefier specs in the form of a quad-core 2.3GHz Qualcomm Snapdragon 801 CPU, 2GB of RAM and Adreno 330 graphics. It runs Android 4.4 with HTC's Sense 6 UI over the top. Although Android has been refining its efficiency over the last few versions, it still suffers compared to iOS when skinned like this. Both phones perform well when completing basic functions, although we'd expect the iPhone 6 to outlast the Desire Eye when it comes to performance over the course of a 24-month contract. Which, given the likely price difference between the two handsets, is to be expected.